ONYX Vocal Band is a quartet, featuring both a cappella and accompanied music from the 20s through to the 80s, including barbershop, swing, jazz, country, spiritual, doo wop for Birthdays, Anniversaries, Weddings, Valentines & Mother's Day Greetings, Retail & Corporate events. What sets ONYX Vocal Band apart from the rest of the crowd is the flexibility of our programs, ranging in length from 10 to 80 minutes and easily packaged in 15-20 minute sets, including a wide variety of ballads, up-tunes & lilts from different genres. Formed in the summer of 2006, ONYX Vocal Band features Steve Hill, Wilf Lemieux, Paul Widdifield and Dave McCaffrey. Collectively, these four close friends have over 100 years of vocal harmony experience, including barbershop, jazz, spiritual, community choral and doo wop. Steve began his musical career in a garage band at the tender age of 15. Harmony singing entered his life in 1995, in both chorus and quartets, with the Newmarket Chapter of the Barbershop Harmony Society; he discovered gospel music around the same time. Two years later, Wilf joined the harmony society with the same chapter and has sung either in the Upper Canada Chordsmen Chorus, or, various quartet combinations. 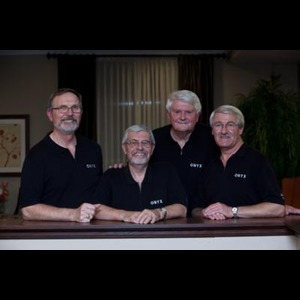 Paul and Dave each became involved in a cappella quartets in high school in the 50s and, between them, have sung in more than 15 small ensembles…quartets, quintets and octets. ONYX is their sixth collaboration since the mid-60s. 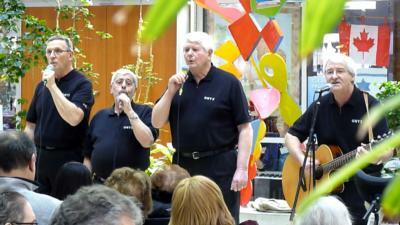 All four are members of the Barbershop Harmony Society. The vocal band's repertoire includes swing, jazz, doo-wop, country, oldies (50s, 60s, 70s) with lead Steve Hill on guitar, gospel and traditional/ contemporary a cappella, many in the barbershop style, often collaborating with other musicians. 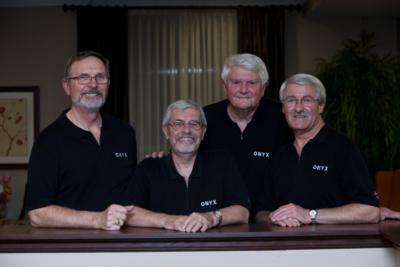 In addition to cabaret & stage shows; corporate, retail and community events; birthdays, anniversaries and weddings; ONYX Vocal Band has made a commitment to continuing community service work. ONYX Vocal Band...is an a cappella quartet that loves to sing! This entertaining group of gentlemen adds a delightful dimension to any event. They have successfully performed at a number of Town of Newmarket functions – Music in the Park, Volunteer Appreciation, Music on the Move, and more. I highly recommend that, if given the chance, you take the opportunity to listen to, and enjoy, ONYX Vocal Band. Thank you guys, again, for venturing out in that monsoon...your performance was excellent...I had many of the (cancer)survivors come up & tell me that they really enjoyed themselves and I could see it on their faces!! Your program was perfect!! Thank you for your professionalism and helping us with our big fundraising event for Canadian Cancer Society. We know we can depend on ONYX to "weather the storm!". I want you and your fellow musicians to know how much we enjoyed having you perform at Rouge Valley Retirement Residence. The feedback was all positive, the residents loved your voices and the interaction with them was very engaging. Please note ONYX Vocal Band will also travel to Aurora, Kettleby, Queensville, Bradford, East Gwillimbury, King City, Gormley, Mount Albert, Bond Head, Schomberg, Gilford, Richmond Hill, Sandford, Stouffville, Goodwood, Keswick, Cookstown, Maple, Nobleton, Zephyr, Bell Ewart, Beeton, Lefroy, Roches Point, Baldwin, Markham, Bolton, Concord, Kleinburg, Locust Hill.